When your Nana knits as many patchwork jerseys as mine did, you have a close bond with the concept of Mary Shelley's Frankenstein. I'm not 100% sure if that's where it started, but for some reason the monster stitched together from the parts of multiple people has always ticked all the boxes of cool for this fan's imagination, as a massive tower of mean - and horror. 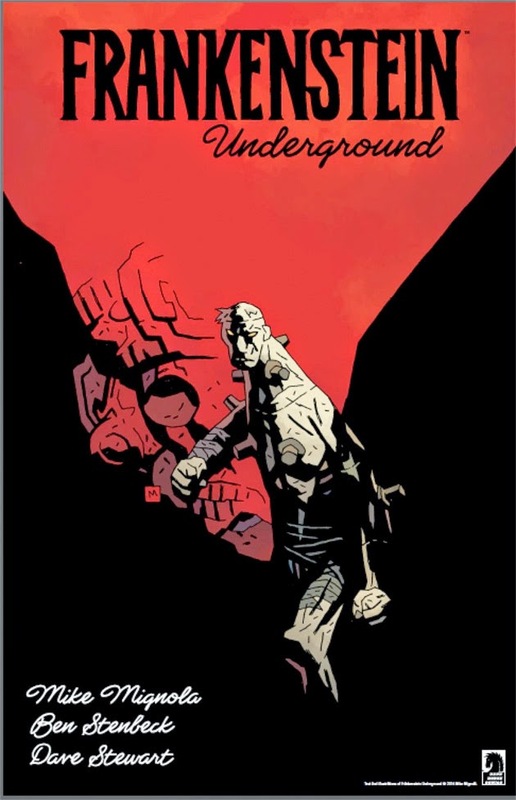 Now Dark Horse is getting their Halloween on early, announcing Frankenstein Underground will debut in 2015, drawn by Ben Stenbeck and written by Hellboy creator Mike Mignola. Promising to be "an important new wrinkle to the Hellboy/B.P.R.D. world", Mignola promises his take on Frankenstein's monster will play true to stitches sewn into the characters history by both Mary and Boris Karloff, who brought the role to after-life in the classic Universal films. With this the latest Mignolaverse title to be named, DC better watch out - the Top Frankenstein in Comics could be an award soon changing hands in 2015. I haven't been this excited since they cast Ron Perlman as Bellboy. Wow. And yet Frankenstein just seems like such a natural fit for Mignola, it's more like a case of DUH. Thanks guys - I think this will be pretty sweet too. Even sweeter if Mike draws the odd issue!